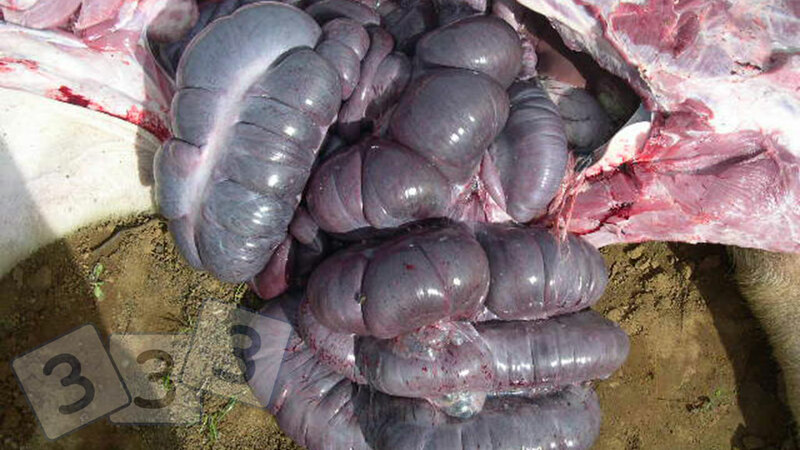 This condition is twisting or torsion of the intestines in growing pigs. The farm workers usually report that these pigs died suddenly. At autopsy of affected pigs, the pigs are often pale with a greatly swollen abdomen. When the abdomen is carefully opened up, many loops of intestine are seen to be greatly enlarged, and swollen with smelly gas and bloody fluid contents. These loops of intestine may be in various bright colours ranging from purple to green. During the autopsy, the operator should reach under these loops, to the base of the intestine mesentery at the spine, to palpate where the intestine loops are twisted into a tight knot. The small intestinal tract of the pig is quite long and hangs loose from the roof of the abdomen in a standing pig. In active grower pigs, this means that twists and torsions of the small intestine can occur commonly, which can quickly result in this extreme intestinal accident, quickly killing the pig. It is often seen in active grower pigs where there is excessive activity, falling about and competitive jousting and overeating at the feeding areas. Other conditions that may appear similar include simple autolysis, Proliferative enteropathy, colibacillosis.